In for repair is a New England Company grandfather clock. This clock is a German bin ban style striking clock. 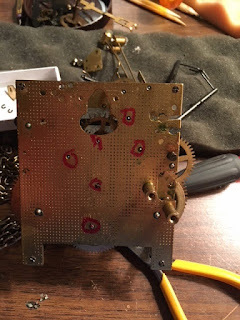 It does not play one of the many standard chime clock melodies. The movement is a Urgos movement. Two weight chain movement. 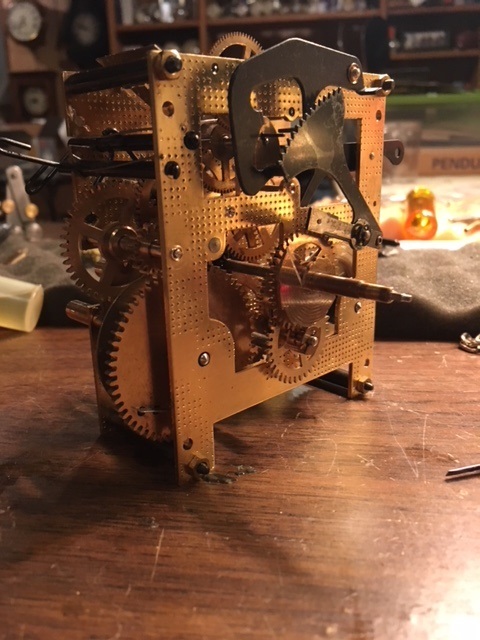 The unique feature of this grandfather clock is that the case comes apart into 3 pieces. The top section houses the clock movement. The next section is the throat where the weights are located. The bottom section is basically the base that gives it height. 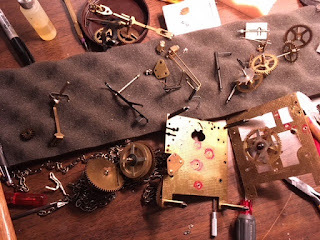 To properly repair this clock the top section was obtained along with the 2 weights and the pendulum. Follow this link for a brief history of the New England Clock Company. The customer stated the clock would not run. Upon removal of the movement, it was found that there was excess wear in many of the pivot holes. It was recently oiled. A little too much oil was applied. The repair of this movement included a complete rebuild of 10 pivot holes with bushings, pivots checked and polished where needed. A number of other items were checked while the clock was apart. 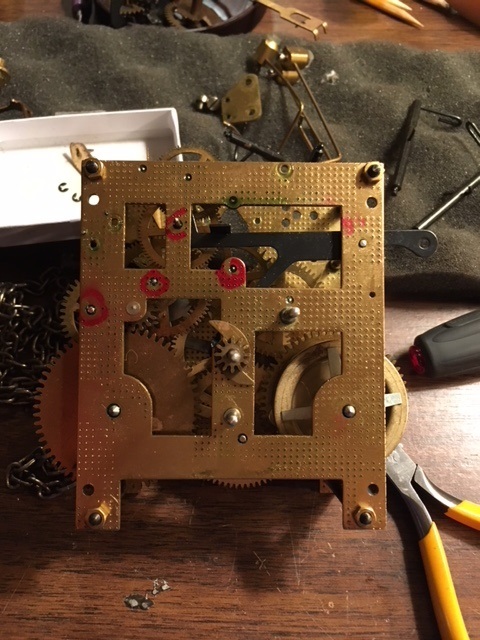 Here are two pictures of the movement before disassembly but after pivot diagnosis. Here is an image of the clock torn apart with each train lined up by function and position. This was taken before the clock was repaired. After all the repairs have been made. The clock was put back together. And finally a short video of the clock running on the test stand. Here we have a Carl Werner German wall clock. Upon arrival, the clock did not run and initial observation, it has been a very long time since any service has been performed on the clock. This is a time & strike count wheel spring movement. A bottom finial was broken from the case and the top bonnet trim was also broken. The suspension spring was damaged and had to be replaced. All this work was repaired and replaced. Here is a picture of the back of the clock movement. Note the stamp: "Werner Deponirt" with a picture of a fox. After some preliminary research found the movement was made between 1880 and 1900. Werner stamped different animals to signify where the movement was made. Carl Werner had several branches: in Innsbruck, Warsaw, Verona and French Badevel .. these animal charactors act as labels for different branches. For example, a rooster in France etc. I could not find the exact location where the "fox" was located. Repairing clocks in the Denver metropolitan area for over 35 years. Including Parker, Castle Rock, Aurora, and the surrounding areas. We do house calls! Most manufacturers including Junghans, Schatz, New Haven, Ansonia, Ingraham, Waterbury, Ugos, Hermle, Seth Thomas, Sessions, Kieninger just to name a few! And now for the explanation of the repair. Here is a picture of the clock upon arrival. And a closeup of the clock face. The logo on the face is the same logo stamped on the movement. As stated, the movement is similar in quality as many of the American brands. The customer stated that it is his favorite clock and an unbelievable timekeeper. It has ran for years without any service. Upon removal of the hands and face, the movement is exposed. It was dirty and oily. Notice the rusted chime gong. The gong was cleaned using steal wool.